Yam Who? is the duo of Andy Williams and Des Morgan, two London based DJ/Producers who caught fire in the early '00s with their scene stealing re-edits and remixes. Between 2003 and 2005, their white label edits became some of the most desired amongst DJs and fans. Not only for their limited nature, but for the fact that Yam Who? arguably made classic tracks, even better. Embracing Soul, Broken Beat and Hip-Hop, Willams and Morgan hit track selection with extreme precision. Songs they chose to remix, like Little Brother's "Make Me Hot", Dwele's "A.N.G.E.L." and Pharrell's "Frontin", seemed as if they were originally made just for the Yam Who? touch. Spotlight on the duo came following the release of their rework to Raphael Saadiq's "Skyy Can You Feel Me? ", an emotionally charged soul anthem that caught attention worldwide. Following the success of the white labels, Yam Who? found themselves in a blitz of official remix and production requests that's had them working into the new decade. Recently, they've established a record label named ISM, which will feature new music from Eric Rico, Alena Heral and of course, Yam Who? among others. The latest release being Ron Baseman's "Deep and Meaningless" LP. 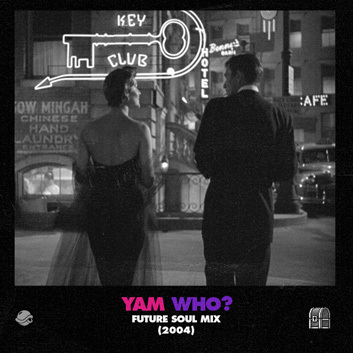 From 2004, we're happy to (re)present Yam Who's "Future Soul Mix" live on Andrew Meza's BTS Radio. Slum Village - Do U? John Legend - Didn't I Used To Love U? Platinum Pied Pipers - Could It Hurt You To Try Me?